Midwest-based Cousins Subs®, a family-owned, fast casual sub shop established in 1972 by Bill Specht and his cousin, is driven by the mission to Believe in Better – both in the quality of food it serves and in the communities it supports. Cousins Subs provides guests with quality made to order grilled and deli-fresh subs using only the freshest ingredients on its signature bread baked daily. Deliver this same local flavor right to someone's inbox! 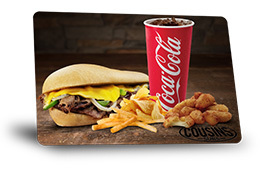 For every thank you, best wishes and celebration, give the gift that their taste buds will appreciate — a Cousins Subs gift card. Simply choose from a selection of designs, include a special message and send an eGift card right to their work or home. N96 W15630 County Line Rd. 5333 N. Port Washington Rd. 5191 W. Brown Deer Rd. 11401 W. Silver Spring Dr.
1075 W. Fond du Lac St.
667 S. Green Bay Rd. For balance inquiries call the phone number to a Cousins Subs' location below.